Porcelain veneers, or dental veneers, provide a long-lasting option to enhance smiles and correct minimally damaged, crooked and/or stained teeth. Getting veneers is a cosmetic procedure that helps mask any inconsistencies you may be unhappy with in your teeth. The procedure is simple, non-invasive, and virtually pain-free. 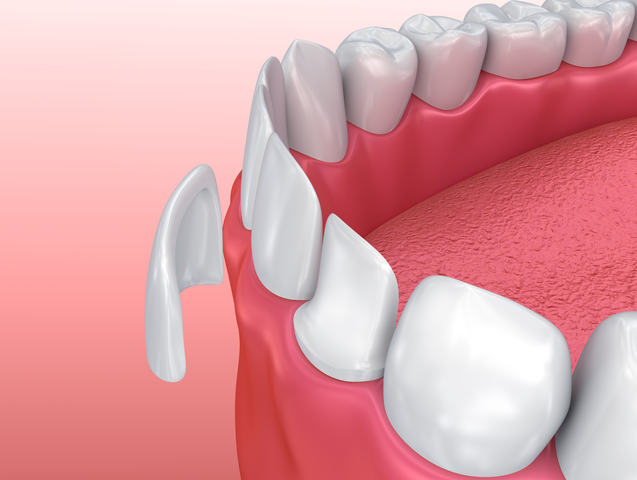 In many instances, porcelain veneers serve as a great alternative to crowns. They are much more conservative than crowns, and when placed properly, tend to last many years following the procedure. The process for completing dental veneers typically only takes one office visit. Dr. Brown will first take an impression of your teeth, which is then used to develop your personalized veneers. Next, the veneers are placed and examined to ensure the shape, fit, color, and size matches the rest of your teeth. If any changes are need, the veneers can be trimmed to fit perfectly with your smile. Once your veneers are set, youâ€™re ready to go! For the following few weeks youâ€™ll be adjusting to the new feeling on your teeth. During this time, itâ€™s crucial to keep up with strict, daily dental cleaningâ€“both brushing and flossing. Dr. Brown may want to see you for a follow up check in to make sure everything has settled properly. If youâ€™re ready to discuss porcelain veneers for your teeth, contact us today! Appointments are available to fit your schedule.